Reigning champions, Japan’s Tomokazu Harimoto and Mima Ito both made successful starts in the respective Men’s Singles and Women’s Singles events at the Seamaster 2018 ITTF World Tour Czech Open in Olomouc on Thursday 23rd August. However, they were very different starts, on a day when in each event no less than seven seeds experienced defeat at the first hurdle of the Men’s Singles event and eight at the same stage of the Women’s Singles competition. Each occupying the no.2 seeded position, Tomokazu Harimoto beat Slovenia’s Darko Jorgic in four straight games (11-9, 11-3, 11-6, 11-4); conversely, Mima Ito was stretched to the very limit by China’s Zhang Rui. She succeeded in seven games (11-5, 11-9, 11-9, 7-11, 8-11, 7-11, 11-9). Similarly, in the Men’s Singles event, Germany’s Dimitrij Ovtcharov, the top seed, emerged successful in his opening round encounter, as did Portugal’s Marcos Freitas, the no.4 seed. Both beat Japanese opponents, Dimitrij Ovtcharov overcame Taku Takakiwa (11-7, 11-8, 11-9, 11-6), Marcos Freitas accounted for Yuki Hirano (11-6, 11-7, 12-10, 11-4). However, for Koki Niwa, the no.3 seed, it was defeat; he was beaten by colleague, Mizuki Oikawa (11-9, 11-7, 5-11, 12-10, 12-10). Likewise amongst the leading names there were defeats for Sweden’s Mattias Falck and Kristian Karlsson, as there was for Germany’s Ruwen Filus. Mattias Falck, the no.6 seed, was beaten by Austria’s Daniel Habesohn (11-9, 7-11, 3-11, 11-8, 11-6, 6-11, 11-8), Ruwen Filus, the no.7 seed, lost to colleague Ricardo Walther (5-11, 12-10, 11-6, 8-11, 11-4, 11-9). In a similar vein, Kristian Karlsson suffered at the hands of England’s Liam Pitchford (9-11, 11-9, 11-3, 11-8, 11-4). Success for the top seeds and upsets lower down the order; it was the same in the first round of the Women’s Singles event. Japan’s Kasumi Ishikawa, the top seed, beat Germany’s Kristin Lang (11-9, 11-6, 11-4, 9-11, 6-11, 11-7), also from Japan, Miu Hirano, the no.3 seed, overcame colleague Mizuki Morizono (11-7, 11-6, 6-11, 12-10, 6-11, 11-5). Conversely, for compatriot Hitomi Sato, the no.4 seed, it was defeat at the first hurdle; she was beaten by Germany’s Sabine Winter (11-7, 8-11, 6-11, 11-8, 11-7, 11-4). Defeat for Hitomi Sato; amongst the prominent names, there were also defeats for Hina Hayata, also from Japan, as there were for Austria’s Sofia Polcanova and Romania’s Elizabeta Samara. Hina Hayata, the no.5 seed, lost to China’s Wu Yang (11-9, 11-6, 11-9, 12-10); for Sofia Polcanova, the no.6 seed, it was defeat at the hands of Puerto Rico’s Adriana Diaz (11-6, 11-9, 7-11, 8-11, 11-7, 11-7). Somewhat similarly, Elizabeta Samara, the no.8 seed, suffered at the hands of Wen Jia, like Wu Yang from China (9-11, 11-7, 11-9, 11-2, 11-4). Opening round success for the top two seeds in the Men’s Singles and Women’s Singles events; it was the same in the Men’s Doubles and Women’s Doubles competitions. 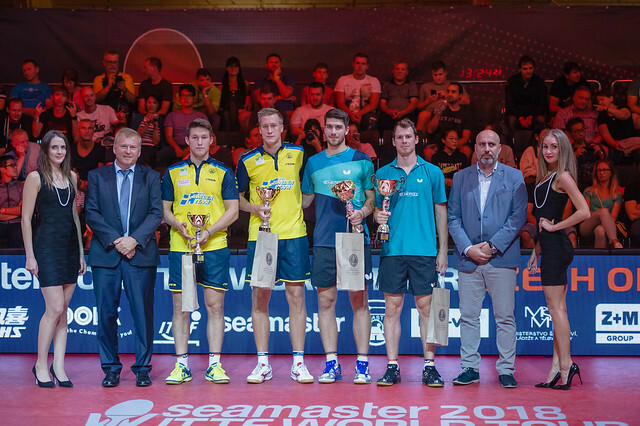 In the former, the defending champions and top seeds, Germany’s Patrick Franziska and Denmark’s Jonathan Groth, beat Frenchmen Can Akkuzu and Joe Seyfried (11-6, 11-6, 11-13, 11-9); Ruwen Filus and Ricardo Walther, the no.2 seeds, accounted for Korea Republic’s Baek Hogyun and Kim Daewoo (11-2, 5-11, 13-11, 11-5). Meanwhile, in the opening round of the Women’s Doubles competition, Hina Hayata and Miu Hirano, the top seeds, overcame the combination of Russia’s Yana Noskova and Austria’s Sofia Polcanova (12-10, 11-4, 11-9); Kasumi Ishikawa and Mima Ito, the no.2 seeds, ended the hopes of Oceane Guisnel and Stéphanie Loueillette of France (11-6, 14-12, 11-2). The second round of the Men’s Singles and Women’s Singles events will be played on Friday 24th August, as will both the quarter and semi-finals of each of the Men’s Doubles and Women’s Doubles competitions.